Most of the emphasis in the media with regard to health and wellness is spent discussing risk reduction strategies for heart disease, diabetes, obesity, and cancer. These diseases are responsible for the greatest numbers of death, increased morbidity, and health care costs in our society. No doubt there is a need for continued dialogue regarding risk reduction, but did you know that chronic kidney disease is responsible for 90,000 deaths annually in the U.S.? 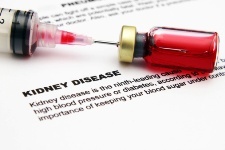 Chronic kidney disease is attributed to lifestyle dynamics, genes, and race. There is a greater chance of developing kidney disease if you are black, have a positive family history, and have factors of a poor lifestyle (these include obesity, type 2 diabetes, high blood pressure, and advancing age). Recently, Dr. Alex Chang and his colleagues completed a research study published in the American Journal of Kidney Diseases that evaluated 2,354 adult subjects between the ages of 28-40 years on the basis of smoking habits, fast food intake, diet quality, obesity, and intake of sodium, sugar, red meat, fruit, vegetables, whole grains, legumes, nuts, and low-fat dairy products. The participants were followed for 15 years and then evaluated with a urine test to measure the level of protein secreted by the kidney. Protein found in a urine test is a very sensitive measure of the degree of kidney damage. Under normal circumstances, there should be no traces of protein found in your urine. After the 15 year follow-up, those who had the poorest diet, who were smokers, and who were the most obese, showed a significant increase in the chance of developing proteinuria. The researchers also found that the odds of developing kidney disease were 131 % higher with one unhealthy lifestyle factor, 273 % higher with two unhealthy lifestyle factors and 634 % higher if they had three unhealthy lifestyle factors in contrast to those who had no unhealthy lifestyle factors. What this evidence tells us is that being overweight, having a poor diet, and smoking can damage our kidneys in a very serious manner. Those who were at the highest risk were people who were obese, had diabetes, high blood pressure, and who consumed more sugar, red meat, and fast food. In my opinion, these people had a great deal of insulin resistance and their level of inflammation was quite high due to their diet, level of body fat, and metabolic syndrome. This chronic inflammation damages the small arteries and capillaries contained within the kidney nephrons which filter the blood and return the proteins back to the blood stream. When these arteries within the kidney become damaged by inflammation, their walls become leaky and small proteins like albumin can leak out into the urine—hence the positive urine test for protein. The way to prevent chronic kidney disease is with lifestyle modification. Improving insulin sensitivity with diet, physical activity, and supplements is a good start. Weight management and the avoidance of sodium, sugar, and fast food are also very important. According to Dr. Leslie Spry, director of the Dialysis Centre in Lincoln, Nebraska, having just one risk factor increases the risk of getting kidney disease from one to three! Dr. Spry also recommends that anyone having at least one risk factor for kidney disease have an annual urine test for protein. I couldn’t agree more with the good doctor! Brody, J., “Kidney Disease, an Underestimated Killer,” web site, July 16, 2013, http://well.blogs.nytimes.com/2013/07/15/kidney-disease-an-underestimated-killer/?src=me, last accessed July 16, 2013. Chang, A., et al., “Lifestyle-Related Factors, Obesity, and Incident Microalbuminuria: The CARDIA (Coronary Artery Risk Development in Young Adults) Study,” American Journal of Kidney Diseases. Published online April 19, 2013.